It can be easy to dismiss the old adage that “you are what you eat,” as something mothers tell children to get them to eat more veggies. But what if the claim has more truth to it than we imagined? The foods we consume impact our health in myriad ways. In fact, some research points to the fact that some healthy foods may even have medicinal properties. Certified health and wellness coach Kristen Stone said that she became interested in the impact foods have on our health when a family member struggled with stomach issues. She now helps others learn to live more healthy lives and teaches the importance of nutrition and the potential medicinal properties of certain foods. “We take food for granted, and we don’t appreciate what it does for us. If we can appreciate it and add better foods to our diet, it can crowd out the bad in our diets and provide overall better health,” said Stone, who studied at the Institute for Integrative Nutrition and is based in Austin, Texas. In Maine, we have access to a wide variety of foods that can help improve your health, including these four Maine foods. Here in Maine, we love our blueberries in everything from muffins and pancakes to yogurt and smoothies to palmfuls enjoyed as snacks. The official state fruit of Maine isn’t just good to eat, though — it’s also very good for you. Elderberries have been getting a lot of attention lately, and with good reason. New research on the health benefits of elderberries indicates that they may be an effective preventative against the flu and can help reduce the symptoms of the flu once you have it. In a randomized, double-blind, placebo-controlled study done in Norway during the 1999-2000 influenza season by researchers at Hebrew University’s Hadassah Medical School in Jerusalem, researchers found that elderberry tincture could shorten the duration of the flu by up to four days when taken at the flu’s onset, compared to those who were given a placebo syrup. Elderberries are readily available here in Maine and even grow wild. However, it’s important to know that the seeds, stems, leaves, and roots of the black elderberry are poisonous to humans, so, if you’re foraging for elderberries, make sure you consult with an expert to be sure the ones you choose are okay to consume. Also, elderberries must be cooked before being consumed as they are poisonous when raw. Elderberries can be used for jellies, syrups, and tinctures. The golden nectar of honey is a favorite in teas, baked goods and more, but did you know that raw honey may also be good for you? Although many honeys in the grocery store are pasteurized to kill any yeast that may lead to fermentation, raw honey isn’t and that changes what it can do for your body. In a 2017 review of the scientific literature on the health and medicinal benefits of honey published by the National Institute of Health, researchers in India reviewed more than 200 clinical studies. They found that raw honey may aid in the treatment of a variety of diseases, including asthma, gastrointestinal issues, and even cancer. For allergy sufferers, raw honey is also said to help symptoms by allowing the body to develop a resistance to local pollen. The key is to purchase local raw honey, which will contain pollen from your area. Honeybees make honey through a fascinating process. One bee collects the nectar and then regurgitates the liquid to a second bee. The second bee passes it on to the third bee, and the third bee spits out honey into the comb and fans her wings at amazing speeds in order to thicken the delicious liquid we call honey. Though they don’t receive as much fanfare as Maine blueberries do, red raspberries are another delicious Maine food worth paying attention to. Also like blueberries, they are delicious in a variety of dishes — from snacking on them raw to cooked into muffins, pancakes and more. Red raspberries bring a brightness to our Maine summers, and are loved for their sweet-tart taste. But red raspberries are also extremely nutritious. 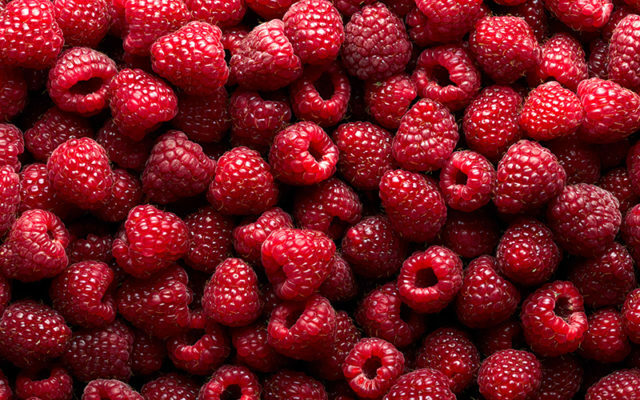 They are a very good source of vitamin C, fiber and manganese and a good source of vitamin K.
Moreover, the initial findings of several recent studies presented at the 2017 Experimental Biology conference in Chicago point to a variety of potential health benefits derived from eating red raspberries. According to the studies, eating red raspberries could aid in better blood sugar control, a reduction of inflammation and better gut health. Maine ranks second in the United States, behind only Vermont, in terms of the availability of fresh and local foods. Look to farmers’ markets, pick your own farms, co-ops, natural foods stores and local sections in your grocery store for nutritious berries and honey. The Common Ground Fair held each September in Unity, Maine, also provides Mainers with an opportunity to stock up raw honey, as well as jams, jellies, and syrups from blueberries, elderberries, and raspberries. We may not be what we eat exactly, but what we eat and how we get our food can certainly have a profound impact on our health.